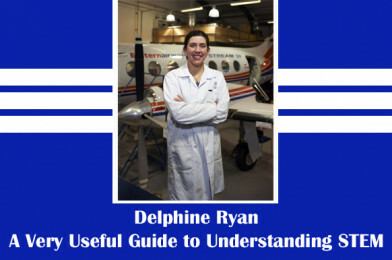 STEM Ambassador, Delphine Ryan, has recently created ‘A Very Useful Guide to Understanding STEM’ which is an excellent introductory reference booklet for both teachers & students. Find out more and download the booklet below, it’s FREE! 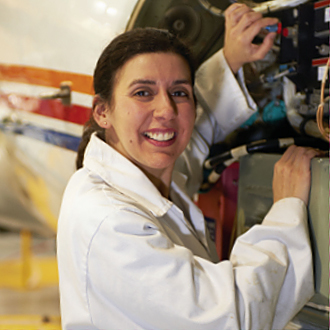 Delphine studied aircraft maintenance and mechanical engineering at university and now works in Defence Equipment & Support (part of the Ministry of Defence) as a project controller in the air domain, working on projects relating to fast military jets and transport aircraft. ‘I have three teenage children and, before attending university, I home-schooled them for a few years. During that time, it became clear to me that if a person is trying to learn a subject, or would like to learn a subject, it is really important to understand what the words in that subject actually mean, and not just ‘invent’ a definition for them. This can be accomplished simply by looking up the misunderstood word in a dictionary or a glossary and finding out its origin, what it means, what it is connected to. When meanings of words are not understood, it becomes difficult to grasp the subject in question and comprehension suffers. When studying at university, I noticed the same thing. I would get stuck on some topic, but as soon as I would look up the words that I didn’t understand in that topic, my comprehension improved dramatically. Based on my experience of home-schooling and my own university studies, as well as talking to primary and secondary school children, teachers and parents, I realised that words like science, technology, maths and engineering (STEM) are used almost daily in schools but many students may not know their proper meaning. This could result in students missing out on a STEM education just because they do not really understand what the subject is all about or perhaps because they believe that the subject is just too hard for them (due to lack of fundamental comprehension). This spurred me on to become a STEM ambassador and to do my bit to help young people build an interest in STEM subjects by clarifying key words in these subjects as early as possible in their schooling, and by actively taking part in activities which increase their interest and comprehension and consequently their potential desire to take up a STEM education. Love STEM? Become a STEM Ambassador! Request a free STEM Ambassador: Our experts can inspire your students!